It is hard to find street parking so plan on paid parking like the North Beach Garage on Vallejo Street or one of the numerous small ones tucked away within couple of blocks of Columbus Avenue. I like a bit of walk, so I park at Sutter Stockton Garage and then leg it. The Union Square in the evening, when you are about to wrap up the day, is always cheery. Now for the location – it is great. Easy to reach by Bart or cable car. None of the riff-raffs of Mission District or hobos of Tenderloin aka “Tandoor Loin” are to be found here. Nothing angry, nothing ugly – no damaged murals on the walls, vomit and pee smell on the streets, or run down store fronts. 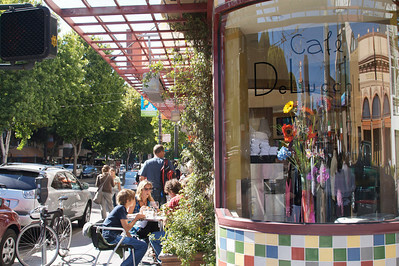 North Beach is one of the few places in the city where the food in affordable, tasty and familiar. In the Mission District, if you are the vegetarian kind you are left with a burrito minus all the yummy bits. On Fisherman’s Wharf, a sandwich will cost you $15. In Chinatown, you may be staring at things that you can not pronounce. Here, not only you can load up on some of the best Italian food in the city, including pizza, there are also many a great bakery. Although I am loathe to eat my food with strangers walking past within inches of my table, I understand that sidewalk tables are very popular at the restaurants here. I usually head to a well loved little restaurant called L’Osteria Del Forno with its small interior tables and excellent pizza. Chocolate destination is always XoX truffles, one of the best coffee and truffle concoction anywhere in the world. 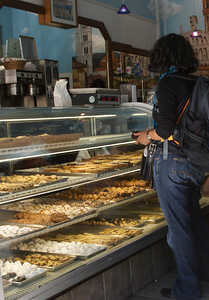 And you must sample all the popular bakeries like Stella, Danilo, Liguria – at each ask for their most popular fare. They are usually a bite each and budget friendly. Molinari Delicatessen would be supremely interesting if this weren’t Bay Area with gourmet shops at every corner (only “a slight exagerration”). If you are the daring kind, get a tattoo at the famous Lyle Tuttle Tattoo shop. Otherwise, spend a leisurely hour looking at old photographs at North Beach Museum. Joe DiMaggio, the baseball player and better known to film buffs like me as the unhappy husband of Marilyn Monroe, was a North Beach boy. The Beat Museum and the City Light bookstore are two establishments worth visiting, first one is more of a curiosity now but the second one is a vibrant independent bookstore that shows influence of irreverent thinking in the choice of its titles e.g., “Jailhouse Lawyers” by Mumia Abu-Jamal. Area near this ex-beatnik hub is also the curious edge between North Beach and Chinatown. Besides a shift from Western to Eastern world in signs and styles, here you will find strange things that fall through the cracks of reality like the Dreaming Room with its assortment of African and Asian curios. What the hell is this “museum” doing in San Francisco? The most exciting view is from Coit Tower, which is only a ten minute walk from the the St Peter and Paul church. 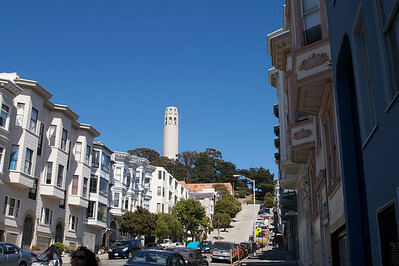 From Filbert steps, leading to Coit Tower, there is a fantastic view of downtown and the church. From the steps of Coit tower itself you can see far and wide towards Alcatraz and Angel island. You can spend $5 and wait in a queue to go up the tower or not but the murals at the tower are beautiful and free. After the walk, come back to Washington Square park in front of the church for a lie down. You may catch a wedding party or a group of soccer players or tai chi practitioners.